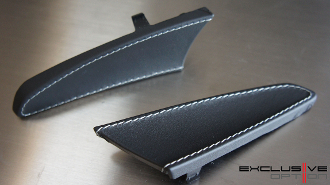 The Exclusive Option Leather Stitched Door Handle Surround Trims feature rich leather that matches other leather components your the door panel. Replace the hard plastic trim that sits behind the silver door handle lever with soft leather and add that exclusive look to the standard door panel. These are a great aesthetic upgrade for your door panels and look excellent when combined with the other exclusive leather door panel options we offer. These parts look especially superb with the Leather A-pillar Triangle Trim option.